I had to take my mom to the hospital (she is fine now) and ended up spending a lot of time there, so I read these three cozies. All of them are books in series that I enjoy. 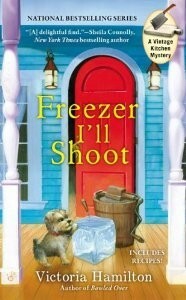 The first is Freezer I’ll Shoot from Victoria Hamilton, the third book in the A Vintage Kitchen Mystery series that I really enjoy. In this book the mystery is interesting. The relationship between Jaymie and Daniel is developed, including their parents. I’m impressed with the romance portion of this book (and the series). In many cozies, the male characters are either exs, in which case they are no go rotten cheating bas***** or they are these idealized new men that swoop into the protagonists life. Daniel is flawed and the relationship is flawed and you truly don’t know at this point whether they will end up together or even whether they should. It is a very realistic touch. The setting is intriguing to me because I have visited similar areas, border areas between the US and Canada. The vintage theme is fun and interesting and has now expanded to a newspaper column as well. Another fun, quick, good read in this series. 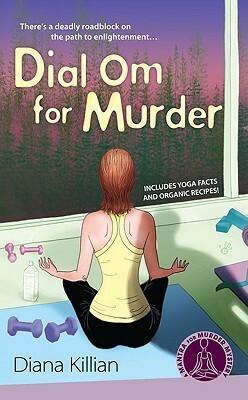 Dial Om for Murder is the second book in the A Mantra for Murder series. I just recently read the first in this series, Corpse Pose and ordered this one right afterwards. The character, AJ, is a very sympathetic character. She is going through a lot including continuing issues with her ex-husband, who we met in the first book. Her romance with Jake continues to be rocky. The adversarial relationship with Lily continues in this book, as does her hot and cold relationship with her mother. In most reviews I read, people love the character of Elysia, Jaymie’s mom, but I find her aggravating and I mean that as a good thing. I get so caught up in the story that her mother drives me just as crazy as she drives Jaymie. A good cozy mystery in a series that I will continue to read. 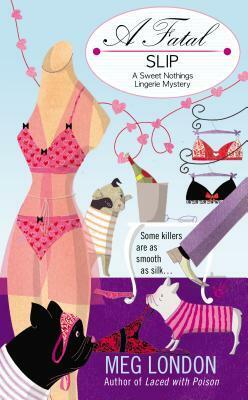 The final book was A Fatal Slip, book 3 in the A Sweet Nothings Lingerie Mystery series. In this book, there is a lot of focus on Arabella, as a former love returns to town at the same time as she is dealing with a health scare. Emma is still the main sleuth and protagonist, although she enlists the help of Liz to investigate the murder, mainly to clear Arabella’s name. Emma’s relationship with Brian continues to progress in a well-paced fashion. I am wondering where the series is going theme-wise because Emma seems to be moving away from the Lingerie shop and into other enterprises. Some new characters have moved to the town and I wonder if they will be recurring, especially Joy, whose name is definitely not well-suited. Cute cozy mystery! This entry was posted in Book Reviews and tagged cozy, mystery.